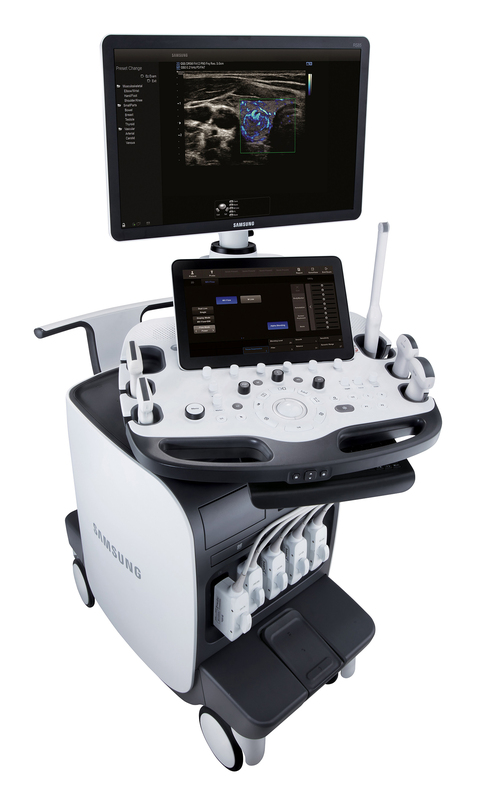 Samsung NeuroLogica has expanded its portfolio of ultrasound systems. It introduced the RS85A, a new premium general imaging ultrasound, at the annual meeting of the American Institute of Ultrasound in Medicine (AIUM) held in New York City in March. The system just received 510(k) clearance from the U.S. Food and Drug Administration (FDA). The RS85A is designed to offer superior image quality and usability, according to the company. Features that include an enhanced monitor arm and increased range of motion and tilt are intended to help decrease user-fatigue and repetitive motions. These improvements allow the user to position the monitor for optimal viewing and control. Some multi-step actions have also been combined into a single step to help reduce keystrokes and repetitive user interface interactions. MV-Flow™ allowing for visualization of slow-flow micro vascularized structures, which can be difficult to assess with conventional power Doppler ultrasound. This feature can also be used to check lesions for indications of inflammation or cancer. CEUS+™ helps the diagnosis and characterization of lesions in the liver using a contrast agent in adult and pediatric populations. S-Shearwave Imaging™ provides new indicators for clinical diagnosis by quantifying the elasticity of tissue or lesions via shearwave elastography, which may help increase the accuracy of diagnosis for breast and liver diseases. S-Fusion™ enables simultaneous localization of a lesion using real-time ultrasound in conjunction with other volumetric imaging modalities. Samsung NeuroLogica ultrasound system introduced at AIUM 2018. Appl Radiol.